← World Cup Gunners in Action: Elneny v Torreira, Super Sunday, Welbz to Start? I don’t know about you but I have been enjoying the WC games until now. Expectations were low and, as Seventeenho keeps telling us, that is the key to happiness! 🙂 Expect it to be rubbish and low and behold it may turn out quite good. The highlights until now were Spain v Portugal and Peru v Denmark. Unfortunately, no Gunners were involved in those games. But I also enjoyed the epic battles between the supreme attack-minded teams and those that need to survive on mean defending and counter football/set-pieces (PtB teams). The Iberian derby finished 3-3 and had everything you’d wished for; if the final is of a similar quality the tournament will finish on a high. There were two teams who wanted to attack and win the game, and that usually is the prerequisite for an open and entertaining encounter. Ronaldo was on a mission, and his late equaliser from a sumptuous free-kick completed an incredible one-man-show hattrick. Whether you like him or not, we have to say that CR had a phenomenal performance, based on talent, personality and determination. The bigger Iberian nation were the better team and they will be kicking themselves for not taking all three points. With a surprise win for Iran and Morocco capable of getting something from their games against their northern ‘neighbours’, there is every chance for a surprise outcome in this group. France got a late winner against a well-drilled Aussie team with an assist for Giroud (late substitute) and are the only ‘favourites’ team to start with three points in the bag. Peru v Denmark was a gem of a match. This game was fast and full of energy, but the ball was also played on the ground with some very good passing combinations on show by both teams throughout the entire game. I enjoyed this game from start to finish and the South Americans really deserved at least a point fromit. Argentina v Iceland was a typical attack v PtB game, reminiscent of many an Arsenal game over the years. The team of Sons were very well organised and determined to keep Messi and co out with a couple of almost insurmountable icebergs in front of goal, and they succeeded. For such a small nation – for every Icelander there are 148 Argentinians! – this is of course a phenomenal outcome; and it leaves the South-Americans in a precarious situation as Croatia and Nigeria will be no pushovers either. The Balkan nation beat a seemingly unfocused Nigerian team as they were caught, according to our esteemed fellow blogger GoonerEris, between (German) tactics and natural swagger. Iwobi, possibly carrying an injury, was disappointing on the left wing, even though he did not see much of the ball as most of the attacks went through the disappointing, wimpy Moses on the right. The Nigerians will take on Iceland next and will need a win, and Argentina will need to get something from their game with Croatia and then play the Super Eagles in the final game. The Western-Africans beat Argentina in a friendly not that long ago, so there will be belief that they can come out victoriously in what is likely to be a must-win game for both nations. All to play for it in Group D.
In Group E, Serbia, like their well-loved Balkan neighbours Croatia, got themselves an efficient win against Costa Rica; and then Brazil were held by a highly efficient, park-the-Alps, Swiss team. It looks like this WC will be all about the battles between the attack-minded teams v the defence-minded teams, and the latter are a lot stronger now then they have ever been with always a chance to score a goal from well-drilled set-pieces and laser-sharp counterattacks. Brazil were unlucky not to take all three points from the game, with some good chances at the end to score the winner. Next up are Costa Rica and that is of course a must win game for the Samba boys. Arsenal’s Lichtsteiner and Xhaka, who both had very tidy games in which they worked their socks off, will need a win against Serbia. For this they will have to be a bit more adventurous, which may not come natural to them. The final game on Sunday saw the Germans losing to Mexico: the biggest surprise until now! The Mexican scored in the first half with a text-book counterattack of which we will see no better example this whole WC, I reckon. The Mexican waving walls were too much for the insipid Germans, who just could not get round or through them whatever they tried. The Germans have it all to do too, as both Sweden and South Korea will also be hard to break down with some attacking weapons at their disposal to hurt the current WC champions. Mesut did okay to get the attack going and make himself constantly available, but the movement in front of him was poor and for most of the game there wasn’t a Giroud-like target man to make some space in the box and combine with. Despite playing ‘proper wingers’ in Draxler and Reus, the Germans were unable to get past the defence from the wings as the defensively impressive Mexicans just did not allow them any space for combinations or through-balls. Germany will have to up their game considerably if they want to survive this (now all of a sudden) very hard group for them. Xhaka was probably the most impressive Gunner on display in the games played until now. Against Serbia he will need a top performance to help guide his team to a vital victory. Yes Total, I’ve really enjoyed the football so far and let’s not forget VAR which has had a definite positive effect on the amateur dramatics we usually suffer. There’s been a notable decline in diving for sure, although the wrestling in the box at corners and free kicks remains a stain on the game. TA, lovely post. It’s obvious you’re relishing the World Cup. About my only excitement so far is Mexico. What am still trying to resolve is whether they’re that good or Germany were so poor. Whatever, I doubt if they can sustain this intensity as the tournament progresses. Your post seems to have lit a World Cup flame in me. Gratias. Yes it’s been a good world cup so far. Portugal-Spain and Peru-Denmark probably my two favourite games. Though I also enjoyed the Icelanders and the Swiss taking a point each from the two South American giants. I think also the refereeing has been good at the tournament. Maybe because they feel more relaxed with VAR to correct them if they get things wrong. Some controversial decisions maybe, but that’s only if you’re looking to discredit VAR, which sadly the English media seems to want to do. FIFA decreed that South Korea have to change their red shirts, so they’re playing in white. Colour clash? Red shirts and yellow shirts! Don’t FIFA have more important things to focus on – like corruption…. Anyway looking forward to seeing Forsberg. Why Forsberg, Kev; is there an Arsenal link? Sweden v Korean is the game of the ants formations. Lots of endeavour but both missing goal threat/attacking quality. Yeah apparently Total, one of many, but as he plays in Germany (Red Bull Leipzig) so it made me wonder if Sven has an eye on him? Shardon the ballas usual. 🙂 The English press’ approach to VAR is indeed bizarre. Yes, VAR luddites in Blighty for sure, Riley isn’t a fan I’d suspect. Nothing can be allowed to sully the EPL greatest show on earth. Good to see that Arsenal have entered an U21 team into the Checkatrade Trophy playing against Division One and Two sides. Good news indeed, Kevsky. A tough but good learning school for the youngsters. Oh the sweed uses of adVARsity! Penalty! 1-0. I’m an Ozil fan, but I felt like he was really missing for most of the game. I don’t know if he created any of the chances they had, but it didn’t seem he was very involved. On VAR, which I’m for….. there was one glaring opportunity to right a wrong in the Brazil game when a player was mugged with 2 arms in the box. It should’ve been looked at and given as a pen, in fairness. The application or lack of, will be the controversy of the future, but at least steps can be taken to improve the overall process. Nothing can be done against bad calls by refs in the current system. I think I heard there were no non-english refs at the world cup this year. I’m sure that’s because they don’t have experience with the VAR system. The PGMOL were apparently one of the main opponents to VAR, you know the organisation that doesn’t have a representative in Russia…. It needs further developing, J, that’s for sure. Re Ozil, he made himself available and looked for people to pass the ball to…. what else can he do? It is a power battle, Kev/J. The refs and linesmen know that VAR is likely to replace/undermine a lot of their tasks, responsibility etc. People have always resisted such ‘industrial’ changes. The presence of VAR is the only reason we have seen very little of the shenanigans we get to see in normal club games (hopefully, this will be same in those leagues that have agreed to adopt technology). Why the English, who pretend to be the big innovators in the game, would reject VAR after accepting goal line technology early, is beyond me. For me, the concerns with time taken is barely non-existent except where the refs choose to stop games to see things for themselves. What FIFA has done is to leave most things to the ref’s discretion; the ref has the responsibility to ask for an opinion from the Video assistant referee when he isn’t certain he hasn’t missed something. He listens for feedback and makes the call to either return to the event, carry on with play, or to see the replay for himself. The difference is where the action results in a goal or something as crucial as an offside goal or a penalty, in which case, the Video assistant may call attention to it and the ref is obliged to accept the call, real time. So, the players can no longer distract the ref by querying every decision as the Ref can simply gesture to the VAR. Today though, the Ref in the Sweden v Korea game has broken up a move with the Koreans bearing down on an interesting goal mouth situation at the other end. The rules suggest he cannot do so unless the ball is in a neutral (non-threatening) area of the pitch. The rule is that the (Koreans’) move be allowed to conclusion, even if it results in a goal; then the VAR is consulted and if the Ref affirms the penalty, the goal scored at the other end (and indeed, any resultant effect of the Koreans’ move) is chalked off. Sweden got their penalty and have won the game. I’d say they’ve deserved it too, as the game developed into a well contested one in the end. Now, on to the Belgium v Panama clash. Time for the Belgians to fulfill some of the promise they show. Jync, Ozil has developed into every fan’s/pundit’s favourite scapegoat; and for no other reason than that he plays for Arsenal (who some just feel don’t deserve or need a luxury player like that), because he hardly received such scrutiny while at Madrid, and God knows he’s improved all-round in his time at Arsenal. For me, he was probably one of very few German players who seemed to care about averting defeat. A lot was made of Phil Neville slagging him off about his commitment only to deride his efforts at defending for the goal conceded, despite him showing said commitment by being the only player to confront the goal scorer, thus playing CB or FB basically. No one asked where were the full back and other midfielders when Ozil raced back to try to help in defence, but many seemingly held him responsible for the defeat. The man played as well as the German team were average at times. Actually felt that the refereeing was good with one exception. Malang Diedhiou (Senegal) who officiated Serbia vs Costa Rica– seemed to favor Serbia’s physicality– and at times felt he didn’t have control of the match. An incident near the end of the match where a Costa Rica coach had retrieved a ball out-of-bounds for a Costa Rica throw-in– had Nemanja Matić incorrectly trying to physically wrest the ball away. If you can get YKs for delaying play– there should have been one for that confrontation. TA– it’s your blog– I recognize that. But if you’re going to set ground rules to depoliticize discussion? Know that what is going on at the US-Mexican border is not in the least bit humorous. Two-thousand Mexican children have been forcibly taken from their mothers/parents since last October– detained separately and indefinitely. TA, on Nigeria maybe I was too disappointed. We normally play with flair and belief which makes us unpredictable. Both were totally lacking in the Croatian match. Hope they’ll play the other matches with absolutely no hand brakes. That’s what can give them a slim chance. JW, it is called irony and is of course no endorsement of Trump’s despicable actions. I am not sure what you are reading into it…. Fair enough, PE. I can well imagine you were left disappointed after that match. I think we all were. But Twitter is great for politics or just venting in public, if someone feels the need. If friends, therapist or spouse just get tired of hearing about it. On the Xhaka extension… I remember Gazidis saying how Emery had done loads of research on Arsenal and knew the issues. I’m hoping that extension means that he has a plan to not only to use Granit, but to help him realize his big potential. I really think Arsene kind of ruined the player that came in, by encouraging him too far forward, when he didn’t have the pace to get back, leading to costly errors. I always said here that he should lay deep and distribute, at which he can be as good as anybody in the game. With torreira, I’m hoping that’s part of the plan. I still think Xhaka is a gem that just needs to be used correctly, and disciplined a bit, like I also thought about Mustafi. He needs more than a bit of discipline. Though I’ve worked on the internet since the mid-90s? Was a moderator and contributor to a well-known political website since its’ inception in 2000– through the 2016 elections. Don’t do Facebook. Don’t do Twitter. Don’t do social media at all. Pretty much a cesspool for the clueless. So in all honesty and well-meaningness? The last thing I need is therapeutic advice from someone who partakes avidly in what I’ve avoided like the plague for 25 years. B. Park the bus is relying on counters. Belgium, watching now, learned and few holding to bring teams out. Germany didn’t, pressed harder and in adding men forward to force the issue lost to speed. C. So far the Pogba, Diaby type DMs are showing well forcing play wide with Presence! It’s a defensive WC really, with many playing not to lose to an extreme. D. Thus, Germany, the loss was a lack of “C”… their spine with Boateng and Khedira was far too slow to respond, and thus Ozil who’s actually quite quick being last back. E. Ozil. Played well, but with 10 men in 2 very disciplined Mexican lines sitting on the box edge and NOT being forced to come out there was no place to put anything. Germany ARE also missing a hard to tackle, clever striker who can poach or get in there..
And Belgium score off a bit of a wonder goal over the top and BKesque-ly over the keeper and far upper corner..
Ozil was delivering for Germany but they weren’t as well positioned as Lukaku Nor as goo/strong at holding their place. Concur with the Khedira/Boateng (/Hummels too) comment– regarding Mexico countering. Saw a heatmap at the half yesterday– where there was almost ‘zero’ Germany activity near the Mexico 6yd box. Where this ought to have been visually obvious by someone on the Germany sideline– before the 35th minute goal? And probably acted upon too? There were no changes at half by Low. The change he made at 60′ was to bring on Reus (OK). But even when it was clear to a novice like myself– that Plan B over the top– was required? He waited until the 80th minute to bring on Germany’s ‘Giroud’– in Mario Gomez. As soon as he did– spaces started opening up. Julian Brandt’s half-volley screamer off the outside of the post nearly bought Germany a draw! But honestly, I felt that Low just didn’t read the need until just 10 minutes were left– to forego what hadn’t worked for eighty. And then it was 3…. Lukaku didn’t over think it, nice clean finish. Per the ‘Witsel as fast-DM’? That, IMHO– is the major need in Arsenal’s defensive setup. Whether it’s AMN or Torreira(! )– it’s ‘closing speed’ that counts. Here with Bellerin running down Ashley Young. Yes gc. Germany lacked a Lukaku or Costa tyoe presence up front until Gomez came on. Their midfield was also too slow. I think this will be a wake up call for them. Ozil played well considering how Germany played. Jw1. Humour doesn’t draw from only funny things. It’s disguting what is happening there, but no reason the whole ‘wall’ nonsense can’t be joked about. I just saw a joke that the mascot for the 2026 world cup will be a brick wall with a sombrero named Wally. I missed the Serbia game. Most of it anyway. Didn’t see the incident you mention. Someone here mentioned match fixing for Russia. I said it won’t happen in Russia’s favour. But if i were being a conspiracy theorist, I could think they will favour Serbia. So I find what you said interesting. Something to keep an eye on. Leno undergoing medical today– Arsenal to announce signing Tuesday. A. Agreed on Germany’s woes and Gomez but he’s no Klose like talisman off the bench.. Oddly all the best German strikers in bundesliga are not German it seems? C. I like Bellerin where he is, but today’s game shows how De Bruyne and Witsel out on a master class in shielding a back *3* and in DBs case adding creaativity forward in the B2B role. Some good analogies for how Arsenal want to look at roles perhaps? De Bruyne was excellent and back far more than I’d expect AR to be to toss in some provocative remarks. And you and I have been involved in at-length political discussion elsewhere– where our roles were reversed– and in a more serious vein. So, you have a measure of my capacity for reason on things political. A minor imbroglio occurred here Friday. The proud use of ‘Trump’ and and an out of nowhere 2 paragraphs on ‘decapitation’ was the spark. I employed a bit of humor to close the circle by expressing how ancient football and decapitation were, in fact, related. An edict was made clear by TA (to me, alone it seems) to desist, which I respectfully did. I do take exception to being trolled (by an amateur in the art no less) the next day– and again upthread today. As a Mod, I’ve chewed up, spat out, even legally prosecuted simps far worse. So, I understand. Maybe it didn’t occur to TA– that so soon following the dust-up on Saturday– that I might be sensitive to even a humorous reference here today. The news I’d mentioned today upthread– is rising to a boiling point here, domestically. TA– you have my apology. That Serbia vs CSC match was the only one I’ve watched so far– where I’ve cringed several times per the refereeing. Not to say that it caused Serbia to win– or Costa Rica to lose outright. But it just felt out-of-character with how other matches had been called. This ref had done matches at the 2016 Olympics — so he wasn’t necessarily out-of-his-league. And it was just the fifth match of the WC. Now? after having seen 10 matches– it stands out to me even more. Bernd Leno (age 26), GK of repute. Rising star in Germany– whose career has flattened slightly at Bayer Leverkusen the past two years. I’ve read many express their enthusiasm– though the only time I’ve seen him play live (TV) he got ‘hung out to dry’ by his defense– losing to Schalke 2-nil. Pretty good stuff in the pool! Half-point separating the 3 of us– after 1 RD / 14 matches. Amazing how many we picked alike. First correct score picked, jw1. Not an easy thing predicting games, you see. Tunisia made England work hard for that win. For me too Eris. Just the one so far! Long day at work today. So just now getting to watch the matches of the day on DVR. Happy to have 2 more 1st RD matches tomorrow– so I don’t have to grind out a full slate of predictions tonight. Did pick the ENG-TUN to watch first. Untold number of opportunities that Lingard and Sterling scuffed, skied, and whiffed on. Jesse mighta’ had 4– the first half alone! Thought it was funny how bothered Sterling was at the start of the 2nd half awaiting the whistle– with dozens of bugs swirling his head. Then discovered it was swarms of mosquitoes! Maybe that’s what was bothering Lingard to distraction– during the first half? I read that there was a “plague” of Mosquitoes from the river Volga upon Volgograd and the stadium. 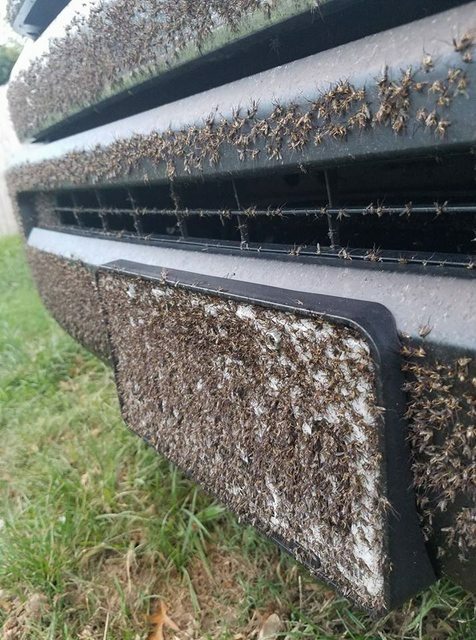 Very strange occurrence, if you ask me and it is a wonder the players could even playin such conditions (I speak for myself, though, because I just can’t stand one Mosquitoe, let alone a swarm of them). Volgograd? Would have thought to find mosquito infestation in more southerly climes. I’d grown up as a child in Miami, Florida– near The Everglades (huge swamp/wildlife reserve) with lots of ’em– almost year-round. Long lived in Houston, Texas (built atop a swamp!). So I do have history with those insects. And not just as pests– they can transmit myriad blood-borne diseases when biting. So ingrained in the culture here– that a nearby (Sugar Land, TX) minor-league baseball team are named– The Skeeters. As an athlete– I would usually eschew the insect repellent many would spray on themselves– because breathing the emanating chemicals deeply when exerting– was likely more harmful than risking the bites. While I kidded initially? Swarms are a health concern. Particularly at dusk– and after. Eris, if you get further south to humid and warm places you will encounter them. Especially when it is Summer, it is easier to get mosquitoes. What irked me is the blatant dive by Gabriel Jesus is being used by the brazilian coach as a controversial decision by the ref. Surely we want Brazil to play samba football rather than diving? That looks and sounds disgusting, JW1. Here in the Highlands we have the midge – a tiny mosquito-like creature that looks harmless but comes in swarms which will not let you have any rest. Especially the head/hair gets targeted and your head gets to feel on fire. England scraped through because Kane has that luck/sense to be in the right place for a tap in and easy header. After the first goal they became more and more clueless as in how to finish the Tunisians off…. and then they gave away the silliest of pens for the equaliser. But first games are usually hard as the players are tired from the previous season and training sessions and the players have to get used to each other in a competitive setting. So to start with a win is pretty good. I freaking hate mosquitoes. They are the only creature I kill without any compunction. I would play football with their decapitated heads if I could. Bloody b*******. Thankfully not too many here right now. But they can get very annoying and as jw mentions, they carry the risk of disease. If I were living where they swarmed like in that picture, I’d either move, or burn the whole place down. Did I mention I hate mosquitoes? On to the football. The England game was poorly reffed. Lots of strange decisions. The two non penalties for England. The incorrect offside decision when Pickford came running out of goal. The wonderful juggling skill called for handball (incorrectly I thought) And then the bizarre nature of both of England’s goals. The keeper couldn’t push it away for the first because of his injured shoulder. And the idiotic manner of giving up a corner while trying to hold on to the ball (to what end?) by that Tunisian player. I just knew that bit of stupidity would be punished. Sometimes the football gods are easy to read. I had Belgium to win 4-0. Was still rooting for Panama to cause an upset. And then rooting for Belgium to get a 4th so my prediction would be exact. Such is the fun of playing a prediction game where you don’t have any loyalties. Sweden and South Korea was such a boring disjointed game. Can both teams get zero points from it for a lack of entertainment? I would institute such a rule in the World Cup when I rule the world. Appreciate the heads-up. First game of the 2nd RD same day with last 1st RD matches was sneaky. Three of us here picked differently. nycgunner, is over at 7amkickoff IIRC. Don’t believe there’s a live column for comments at present on that site. VAR is going to be totally discredited if referees lack the basic moral fibre to give decisions in the box. I saw the England game after the event so I enjoyed it minus the stress. But the referee bottled it for me, Kane twice and Maguire wrestled to the ground, if it carries on then the competition will lose creditability. Only the referee in the Croatia vs Nigeria game had the courage and honesty to give the penalty. All FIFA’s big talk about sorting this problem has come to nothing. I enjoyed the way that England didn’t panic but just kept playing their game until Tunisia cracked. It was almost a Germanic result. Thanks jw1.. There is a comments section there. Maybe you’re on the previous blog post? I mentioned the missing pick to nycgunner. Appreciate you making the rounds! Busy again– hadn’t had a chance to surf all my coves this morning. See? Now I’d be more leery of the midges! Mosquitoes by-and-large don’t bite your head– and you can cover most everything else. Though here, in Summer, when it can be 95F/35C and 90% humidity? Covering up is a slow death all-its-own. It gets up to 48C here. People even die from heatstroke if they aren’t careful. That’s hot Shard (where is ‘here’?)! We get low-100+F (38+C)– but everyplace here has A/C. It’s in northern cities, like Chicago, where it gets to 90+F (33+C) and folks don’t have A/C that you have deaths in Summer. OK, about to watch a little of the land of my father’s father(s) (Poland) against one of the most interesting African countries (to me, Senegal–sub-Saharan, Islamic, French-speaking, etc. )… And… I thought this might be a moment to poke my head up, ground-hog style, from my (most recent self-imposed) ban in order to make some comments. Uh…That’s fine–a bit harsh about the egg-sucking, IMO, but fine…ergo, my (attempt at) ending my writing here. But then, IN THE VERY NEXT POST, not only do I get a shout out re: personal philosophy (low expectations…) but you drop a Trump and border wall reference (meant to be ironic we’re told, down below). Sorry, but that’s NOT about ARSENAL and, if you were to talk to ANY of the Americans (of Mexican descent)–who know their futbol, btw, and know that Arsenal (fecking) blew it by failing in developing Carlos Vela–they would tell you that they do NOT appreciate jokes about the terror that is being foisted upon them by our (non-democratically elected) president and his attempt to systematically pander to his supporters by dehumanizing Spanish speaking peoples of the Americas. Apologies in advance for the Trump supporters on this blog–I know, I know, there’s only ONE America…And Trump is just making it great again. Personally, I stand behind EVERYTHING I wrote in my previous comment no matter how jnyc tries to characterize my views into some sort critique of elites and elitism (or something). Like JW suggests, he’s not a very good troller (or thinker, I’d argue), but you seem to appreciate his comments (and his dismissal/blame of all those dark-skinned Arsenal players, which is probably just a coincidence). Meanwhile, it’s still OK for know-nothings to say go and maim the guy who has given BY FAR the best individual performance at this world cup…though (at least?…) that same comment writer notes (or parrots from elsewhere?…) that Ozil’s Turkish roots (and recent photo-ops) may be something that might affect the German team. So, my question is this: Why are these sorts of NON-ARSENAL comments with overt (or subtle/ironic) political (or philosophical or just plain idiotic) overtones tolerated–or at least not sent to the trash heap, i.e., deleted.? We’ve also got mosquitoes up here…and one reason I’m looking at Mexican areas in Jalisco (south of Puerto Vallarta) instead of Nyarit (to the north) is due to fewer jejenes (kind of a no-see-em sand-flea which bite). Midges are bad too…(more in Oregon and Washington, inland and at lower elevations…) if you can’t find a way too ignore them… They don’t really bite, I don’t think. Okay, I have removed the reference in the blog. It was meant as a compliment towards the incredible organisation and sturdiness of the Mexican defence but I can see why it’s regarded as in bad taste given the current situation. It was not meant to be a political comment but I can see why some believe it is, and therefore it has been removed. Please let’s all refrain from making political comments going forward. Senegal started out looking stronger and speedier, only letting up after their goal. An unfortunate one for Szczesny but something FIFA will have to review since the VAR hasn’t done so. Niang had gone off for treatment and was jogging on, unnoticed, when Krychowiak played a lobbed back pass and Niang pounced, getting to the ball before poor Szczesny. Should he be allowed to come on so surreptitiously? Shouldn’t he be made to come onto the field from a neutral area? No sweat from me though. Felt Senegal would win and predicted the correct score as well, jw1. Seventeenho. nothing to add other than NO politics on my blog. Hmmm. Reading it was flies over Volgograd and not mosquitoes. Not sure anymore but that was from Harry Kane’s interview. Making reference to a political equivalent on a football related topic, usually in jest and/or tongue-in-cheek wouldn’t raise as much of an eyebrow as a full blown deliberation on a subject which divides opinions and may affect the spirit and intent of the blog. That’s why I can relate with TA’s position on the matter. Of course, if there’s a subject with global implications, affecting us all, it will be understandable if it comes up in the course of a thread. When the subject involves a topic or persona who divides opinion and affects personal relationships on the blog, it isn’t helpful to persist on such a subject, in my view. We cannot forget the blog is, first and foremost, a football blog of an “all things Arsenal” bent. It will help if we can keep things focused, even if certain topical matters in other sports should and have been discussed here. Politics, while hard to avoid, is another thing altogether, methinks. Of course Eris– they might still have been mosquitoes. Looks like ElsuperNeny will be back home v soon. Yep. Welcome to the Arsenal, Bernd Leno. If (whenever) Sweden and Denmark play each other, the letters that are used for the teams are SWE vs DEN (Sweden) and the remaining letters which are not used are DEN and MARK (Denmark). Good news re Leno. The Gambian ref was impressive, Eris. Does anybody know any of these people other than the obvious ones? Most of them are Emery’s guys TA. Worked with him for many years. Javi Garcia was at Swansea as GK coach for a year when Fabianski went there and had some good things to say about him. Interestingly, I did get to meet that Ref some time in 2014, while I was out working in that nice little country. Was visiting a prospective client and the Ref happened to show up. We had a chat and I recall leaving him thinking I met a man who took the job rather seriously, even if he didn’t look like he was making a fortune from it, at the time. He has been to 3 African cup of nations and was at the centre for the last finals. He did say he was at the 2012 London Olympics too (didn’t check to confirm). I recall he was in Brazil in 2014 as well. Very firm and has a stare that says “I am in charge here”. Who is this Steve Bould? Soy Esteban Boldado. Lol, TA. That’s some stare. For a split second, I had to check that my device hadn’t paused the video/Gif. A stare to get anyone uncomfortable, indeed. Oh jw1.. ‘Here’ is Delhi, India. Jack Wilshere has confirmed he will leave Arsenal this month. Expected but sad news. Sorry. It’s late and I’m a bit out of it right now. I am sad about Jack leaving, but I’d made peace with it some weeks ago. I think he should go to Italy if that’s an option for him. The league will suit him far more than England. Obsessed to the point of comedy. Imagine me and “you know who” giggling at the hysterical whining on a football blog. Beyond the pale. Reflecting evil– to gloat. Sad that Mad Jens is out after half a year. If he stayed the fans would have liked it. Only Bouldy stays, and why does Jens have to go? He could have stayed to gain more coaching experience. Jacko did well last season and was a mainstay for our Europa League. If a better player like Torreira did not get signed i will complain about it. And Welcome to Emer-ates Leno. Meaning that Ospina will find another club. Just read Jack Wilshere’s ‘arrivederci’ posted at Instagram. Find it odd that he’s ‘giving in’. Would have thought he’d have stayed– and ‘fought for his place’– regardless of Emery’s inference regarding playing time. Wilshere had always forced his way back onto the pitch when healthy. Wondering if this was a sort of litmus test from management? If he had defiantly remained– might he have earned the respect required to earn more minutes? The reduced offer remained open to him (with incentives). He could have helped to rebuild the club– and surprised everyone. Now? He’ll get a decent payday someplace as a Bosman. Sometimes you have to be challenged to exceed your abilities. This was Jack’s chance to do that. I think that Emery wanted Jack’s salary off of the clubs’ books, still no news on Ramsey and Nelson but the club is showing a more ruthless side with contracts. I actually suspect that Santi may have got an extension if Wenger had remained in charge. You know, every summer you would imagine that a manager would look at his team/squad and know where it’s weaknesses are and the positions he needs to strengthen. That, after all is a vital part of being a manager. But it seemed that for a long time, that the Arsenal transfer strategy was far from clear and when we needed, for example, a centre half, that the manager would go out and sign a midfielder. All this has been long documented but mainly overlooked and excused because of a mixture of respect and hero worship for our recently departed manager. So it’s thoroughly refreshing to see the approach currently being taken by the new management team and the clear weaknesses in the squad being addressed, even with the limited budget our owner has given us to work with. No more deadline day angst or supermarket sweeps following a disastrous result. We have people who don’t dither but want to get the deals done, rather as it used to be under David Dein. Interesting to see that Steve Bould and Darren Burgess have been to Australia studying their methods Down Under among Aussie Rules etc. An open mind to different kinds of coaching is the right way to go, embracing new ways of doing things cannot be a bad thing. Steve Bould has, unfairly imo, been castigated and ridiculed in certain sections of the support for his perceived inactivity on the coaching front, so it’ll be rather interesting to see if Uncle Bouldy is given his head by Unai and then maybe we’ll all see what he can do – or not as the case maybe? Per Jack? I’m not really seeing it as being a misfit in Emery’s pressing game. Here’s the thing I’m seeing. The offer remained on the table. That meant Jack had a perceived role, however it might be ‘reduced’. I can relate on a personal level. The game that HT and I played– Ultimate? I played in the ‘Men’s Open Division’ until my early-40s. Like football, almost unheard of in that sport. Early in my career, I was a main cog on a very good team. That club waned, and eventually dissolved. I joined the other club near Houston– right as it became a national power; eventually playing in two World Championships. My ‘role’ with that club was to play as the ‘quarterback’ and captain the youngsters in ‘friendly tournaments’. The club would register 2 teams at these tourneys– and my job was to lead the B-team– to help develop the guys who eventually could become mainstays. The point– is that Jack could have played that kind of role. Maybe not the ‘big wheel’ (though at times earning a larger role in the first team)– getting the League Cup or FA Cup starts. Carving out a role with Arsenal. Helping to shape what is to come– with his beloved Gunners. Jack could have been successful in a role. Wilshere still believes, I’d imagine, that he can still play his way back into the national team, but it would all depend on how much exposure he’d get in the league. We have no real idea what has been said behind the scenes, how Emery views Jack’s fitness and ability to stay at the top level for an entire season or not? If what Jack said was true, that he was prepared to sign, then Emery must have made it clear to him that he wasn’t in the managers plans. If your manager tells you that then there’s nowhere else to go mate. I see your point regarding Jack’s age. Though I’ll argue the reality of his playing his way back into the national team– with Southgate at the helm. Particularly, if England make the quarters/semis or better. That Ox wasn’t in this squad? And no other player in that team with Jack’s skillset? Doesn’t bode well for that happening. There are ZERO England players playing abroad. If Jack goes to a less-talented team– such as West Ham– or similar? Think about his season at Bournemouth. I don’t think he shines without upper-tier players around him. Say what you will about Arsenal’s decline– but playing with Giroud, Sanchez, Ozil, and Ramsey made Jack a better player. If Jack go to United (as has been rumored)– he’ll be Mata’d or Mkhi’d by Jose. Where else? Pool? Chelsea? Leicester? Just isn’t (IMHO) going to happen anywhere else. But possibly, it could, with an outside chance– happen at Arsenal. Make no mistake. I like Jack Wilshere. And wish him all the best. Nice one, Admir. How five years just come and go! Yes, indeed. There are two main reasons for that. Firstly, English players don’t want to take a paycut to play elsewhere. It’s much nicer to sit on the bench and get a hefty paycheck at Manchester City, Manchester United, Chelsea, Arsenal or even Everton than go to a different country. Secondly, English players don’t possess neither tactical nor technical quality to get a call-up from the biggest European clubs. JW I think we (England) could have a couple of players of national team ‘quality’ plying their trade in the Bundesliga in a few years. The Academy system in England is among the best in europe at this time, but getting an early chance in the EPL is extremely difficult, so I can see quite a few young Englishmen trying their luck abroad in the near future. That would give English players a more complete education. If Jack took the chance and moved to Italy I think it could be the making of him even at this late stage of his career. Who in their right mind would rather play for Crystal Palace or Wolves or West Ham instead of AC Milan or Juventus if the opportunity is there to do so? And if Jack did go to Italy JW and was doing well in Serie A then I doubt that Southgate would ignore him. Fitness was the issue for Jack and England so I cannot criticise Southgate for that. Is it me, or are Portugal a reflection of Mourinho. In a perfect world Jack goes to Italy– makes the dream come true. I say that’s improbable. Because Jack seems like a proper Dad. Three young kids– by two Moms– all in London. Where he makes it work somehow. I could cipher the equation further– but the probable sum– is him staying local. Even a year ago, I was fretting about Jack leaving for free. I wanted to believe that a great midfielder was still in there. If he had stayed, I would have continued to believe. Now I just hope so, because honestly, he was just ok this past season. He can get back to about 3 years ago when he was dominating the national team, I really hope. ….. Btw, Now I hate the national team full of those thug spurs, arrogant Dele, ex spur punk Walker, and Kane, who is good, but it both angers and mystifies me that he hasn’t graduated to a real club, still! To me, this along with the fact that no big club has really wanted him, lowers him in my estimation. Where Jack goes will make a huge difference, and if he stays in London or England in general, for reasons of family and comfort, I will have less respect for him as a player. I will hope to see him excel wherever he goes. But this climate of comfort at the club must change. I agree that Italy makes great sense, i am almost sure that if he applied himself there, he would be at the very top at his position in serie A. Because it’s likely we’ll never know Jack’s reasoning? Feel free to disagree with me directly J. And stop the sophist trolling. No matter how many words you wrap it within? You’re not gonna believe this, but I wasn’t referencing any one comment, because I just skimmed through and wanted to give my take on Jack now that it’s official. I’m not going to lie and say that I’m above a little indirect hit occasionally, but this was not even close. No need to read things into every comment. I’m sure everyone else took it as it was intended. I don’t want players any more, whose first priority is comfort and family. Their families are well provided for by the fans, really well. To a level we can barely imagine. I don’t wanna sound mean, but your feelings just aren’t that important to me. I know we have had great back and forths about Arsenal in the past. I wonder what has changed? I sure haven’t. Your comment read like a middle-school write-up of the ‘Arsenal neighborhood’ J. Wrapped around my opinion about Jack and parenting possibly being important to him. What changed? Is you trolling me 3 times now in 5 days. And no. I really don’t recall you much responding to my comments– even when I’ve responded to you by name in the past. Almost exclusively one-way conversations. So now that you are posting weak gruel with references to my posts? Offering me therapeutic advice? You– absolutely have changed your behavior. Come on guys. Everyone is sad about Jacko leaving. And no speculations about his next club please. This is his personal preference. It would be good for English players to play abroad and in more technical and tactical leagues. Maybe they like the security of England though? The goalkeeping position recently seems to be taking an unlikely course since the arrival of Leno, as I thought, as I’d guess that most Gooners did, that David Ospina would the first senior goalkeeper out of the club – and he might still be, but the rumour of Arsenal being prepared to sanction a loan transfer for Petr Cech is a shock to me – if the rumour is true? The number change was cosmetic to me, I just assumed that Cech would spend next season as our cup goalkeeper and he may still do that, but the links to Napoli are a complete surprise to me. I guess that it’s plausable that Emery would allow both Cech and Ospina to leave if the sums add up – and finance may play its part in any decisions taken. Would Martinez and Macey really be enough as back up to our new Numero Uno? Can’t see Cech departing Kev. Ospina, yeah? Find it odd that Cech would now want to leave London. A main concern three years back in asking Abramovich to consider his move to a crosstown, heads-up rival? Were his children, then 5 and 6 years old (now 8 and 9), being uprooted from school and friends. Can’t see Cech leaving– independent of Leno’s arrival. Cech is still a capable #1. Would make a stout #2. Speaks German too. It will be better for Ospina to leave, Cech to continue to be our Numero Uno and Leno to be the backup. There were news about Leno dropped from the final 23 of the German team due to his calamities, but the question is: Which ‘keeper is not a little mad? I see Leno as the type of player Arsenal must look for… we can’t afford the most expensive established stars, and they probably wouldn’t come without champions league football. Leno has extremely high upside, is a great shot stopper, and is affordable to us. Oddly, a little bit like Szczesny, athletic, big, quick, maybe concentration issues. I don’t know what Arsene was doing on that one either. I’m happy with Leno, and I trust Sven, especially on Bundesliga players. I don’t think we’d spend £19m plus on a keeper who’d be sitting on the bench. Who goes between Cech and Ospina? I suspect that would not be a footballing decision. In sales, Ospina would fetch more money. Cech’s wage bill off would be an incentive. But what team would want to be parting with £100k per week on Cech?